A large school district spanning both rural and urban environments needed support with its strategic plan. 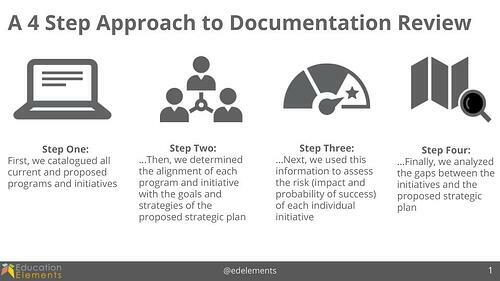 Education Elements supported the district through a collaborative planning process over a 4 month timeframe. We focused on building alignment across the different initiatives serving the diverse population of students, including those related to instruction, technology, school climate, professional development, and personalized learning. While each school in the district has diverse needs to address, the district needed to align on a common set of goals and agree to instructional priorities that were in alignment with their vision. The district lacked an instructional framework to provide the foundation for professional learning, teaching and learning, and leadership development across the district, leading to cases of high levels of variation and potential inequity. 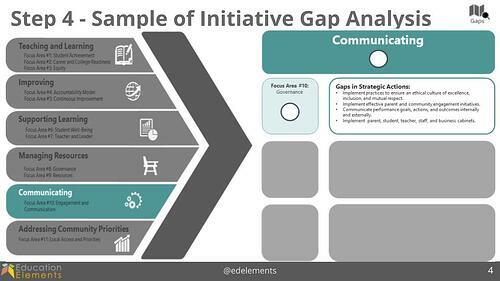 Prior to identifying and aligning the district’s strategy, initiatives, and priorities, the district needed a baseline risk and gap analysis of current district initiatives and we needed a deep understanding of the history of how they got to where they were. 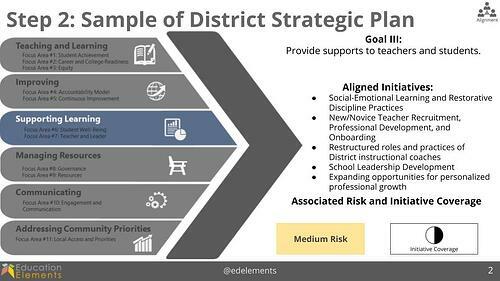 The purpose was two-fold: (1) to understand the current state of district strategy, structures, and efforts; and (2) to lay the groundwork for continued analysis of program and initiative alignment, associated risk, and support structures for principal, school leader, and teacher. Through our analysis of the current state, we began to develop recommendations for the future state of the district based on the risk and gap analysis. Throughout the process with Education Elements, the perspectives and feedback of key stakeholders in the district, school, and community were taken into consideration. We also utilized the national landscape to ensure best practices from Education Elements district partners and others was informing the future-state planning. In addition, we developed a visual representation of aligned initiatives and structures. Education Elements also shared a few immediate recommendations to support the vision of the strategic plan. Restructuring Coaching Roles - Determine accountabilities of each individual coaching team and identify how different coaching teams complement one another’s work. Determine the ideal state and structure for coaching supports within the district, and develop a timeline to reorganize coaching roles and practices to support the vision. School Leadership Development - Identify the roles and accountabilities of all district staff who will support school leadership development in the upcoming school year. Determine desired proficiencies for school leaders at various categories of schools (based on previous performance and/or contextual factors) and identify desired growth/performance metrics for these categories. 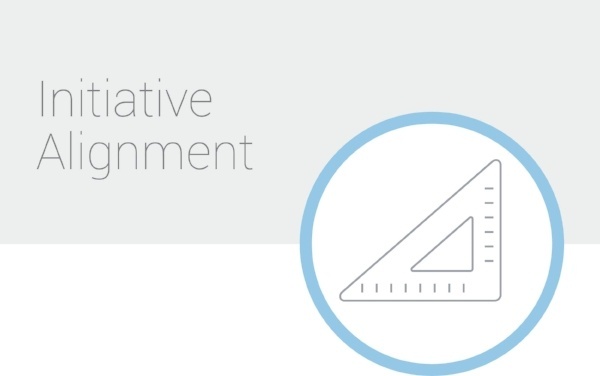 Through our partnership a few key resources were created: report on the initial findings on the alignment across initiatives, a strategic plan action plan, and communication tool. Each resource had key actions for the various focus areas and stakeholder groups. While the district is early in their implementation of the strategic plan, they are already seeing shifts in teaching and learning. 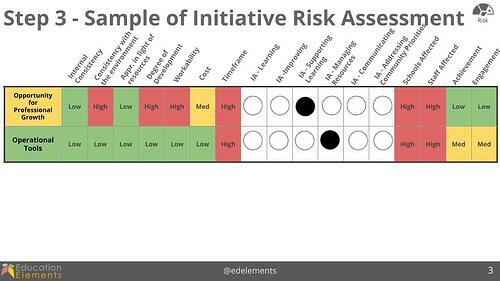 "School districts are much better at adding initiatives than aligning them. But knowing how everything fits together is critical for any single initiative to succeed."